Researchers have been addressing social judgment from a cognitive perspective for more than 15 years. Within recent years, however, it has become increasingly clear that many of the models and assumptions initially adopted are in need of revision. The chapters in this volume point out where the original models and assumptions have fallen short, and suggest directions for future research and theorizing. 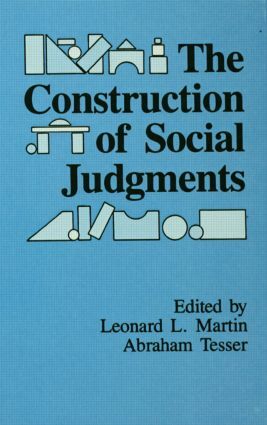 The contributors address issues related to judgment, memory, affect, attitudes, and self-perception. In addition, many present theoretical frameworks within which these different issues can be integrated. As such, this volume represents the transition from one era of social cognition research to the next. "…a must for anyone in the field of social judgment. The chapters in this volume are uniformly excellent. Martin and Tesser have assembled an outstanding set of authors, all major contributors to the field….This book has a very contemporary feel to it and compares quite favorably with such other texts as those in the Ontario Syposium series…"
"…will be of interest to those behavioral decision researchers who want to provide themselves with some provocative insights as to how to advance a 'constructive processing perspective' on behavioral decision making." Contents: Part I:Emerging Problems in Social Judgment Research. R.S. Wyer, Jr., A.J. Lambert, T.L. Budesheim, D.H. Gruenfeld, Theory and Research on Person Impression Formation: A Look to the Future. T.D. Wilson, S.D. Hodges, Attitudes as Temporary Constructions. E.T. Higgins, J.A. Bargh, Unconscious Sources of Subjectivity and Suffering: Is Consciousness the Solution? Part II:Research Supporting New Assumptions. E.R. Smith, The Role of Exemplars in Social Judgment. G.L. Core, Cognitive Phenomenology: Feelings and the Construction of Judgment. R.C. Sinclair, M.M. Mark, The Influence of Mood State on Judgment and Action: Effects on Persuasion, Categorization, Social Justice, Person Perception, and Judgmental Accuracy. L.L. Martin, J.W. Achee, Beyond Accessibility: The Role of Processing Objectives in Judgment. N. Schwarz, H. Bless, Constructing Reality and Its Alternatives: An Inclusion/Exclusion Model of Assimilation and Contrast Effects in Social Judgment. Part III:Toward Theoretical Integration. F. Strack, The Different Routes to Social Judgments: Experiential versus Informational Strategies. M.G. Millar, A. Tesser, The Role of Beliefs and Feelings in Guiding Behavior: The Mismatch Model. D.E. Carlston, Impression Formation and the Modular Mind: The Associated Systems Theory.